First, sincere appreciation to our friends at Twobobs Decals for providing IPMS/USA these review items. 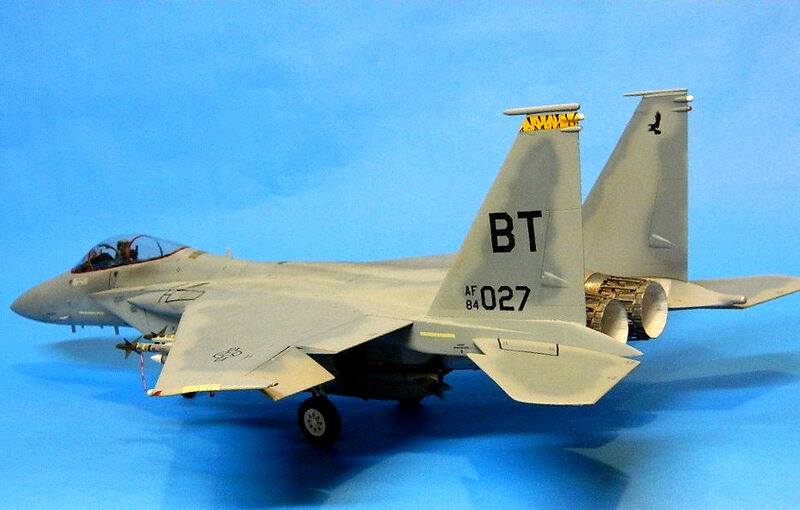 These sheets provided impetus for me to finally properly build an F-15 from one of my old units. Twobobs have consistently filled a niche for decals previously unavailable from other sources. Enclosed within the standard protective plastic sleeve are three decal sheets to mark F-15Cs from the 36th TFW at Bitburg AB, Germany accurately. Although this base is now closed, it used to be the hub of F-15 operations within central Germany. 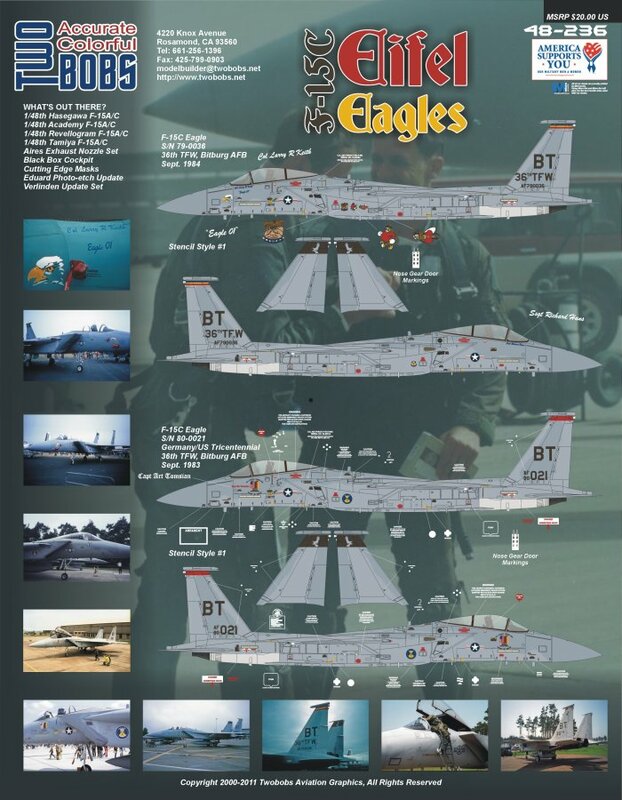 In my former life in the USAF, from 1988 through 1990, I was the F-15 Weapon System Maintenance Manager at 17th AF at Sembach AB, GE; we had to provide daily tracking and status of all our jets, as the "Cold War" was not so cold and we only had so many Eagles to fend off the Russian hoards... Was an interesting time, and I didn't realize how good I had it. Markings are provided for various aircraft of interest. The first are standard light and dark ghost gray schemes for early Eagles, 79-0036, and 80-021, both jets of which had not yet received MSIP (Midlife Service Improvement Program) upgrades (giving the Eagle ability to use AMRAAM, along with other avionics upgrades, and denoted by a stinger radome on the starboard (right) stabilator boat tail fairing) or "Pacer Buffet" vertical fin external fin modifications. 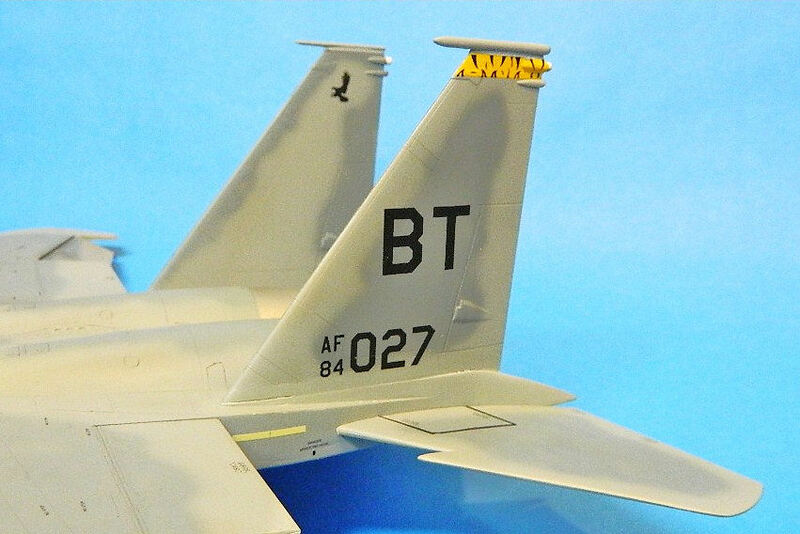 (These are represented by scab patches on the upper fins of the Tamiya kit). They were specially marked, 036 as the wing commander's aircraft in 1983 with all three Bitburg squadron patches on the intake, 80-021 as the "German/U.S. Tricentennial." 79-053 is also a 1983 jet, shown as the 53rd TFS command bird. Both high visibility and low visibility insignia are provided, and are appropriate for the transition period. Fast forward to my era in Germany (1986-1990), and it's obvious things have changed. Many of the high-visibility markings had disappeared for combat survivability. Grays and blacks were the order of the day; the much-hated-by-paint-shop-personnel stencil markings for every panel and screw on the jet had disappeared in a cost-saving move by our commanding general (two-star at the time, Rutherford... yes, it takes time and $$ to stencil "85/85" next to a panel line and screw); what remained were basic warnings and notices (rescue arrows, honeycomb "no step" panel markings, etc.). If you don't know what I am talking about, find an old Microscale F-15 or F-4 sheet and learn the meaning of mental decal pain. The remainder of the markings are used for Desert Storm 1 marked jets; at least two are "MOD EAGLE" marked with FS36241 and FS36176 grays, while the remainder are standard Ghost gray light (FS36375) and dark (FS36320). These are all MSIP birds, as noted by the stinger radome on the starboard boat-tail fairing next to the right stabilator. Several are marked as MiG killers; the Iraqi flags have separate stars to put over the center white stripe. That is serious detail! This sheet has been released in all three scales; 1/32, 1/48, and 1/72. I had the 1/32nd sheet provided; the 1/48 sheet was also sent, and I shall work on it later. For now, the 1/32nd sheet provides an impressive performance by Twobobs as usual. Presentation was flawless, and it's clear Bob and crew have done their homework. All the details match what I have from my time at Sembach: weapons loading competitions and various other venues provided more than ample opportunities for me to record markings, and it's obvious the research was there. 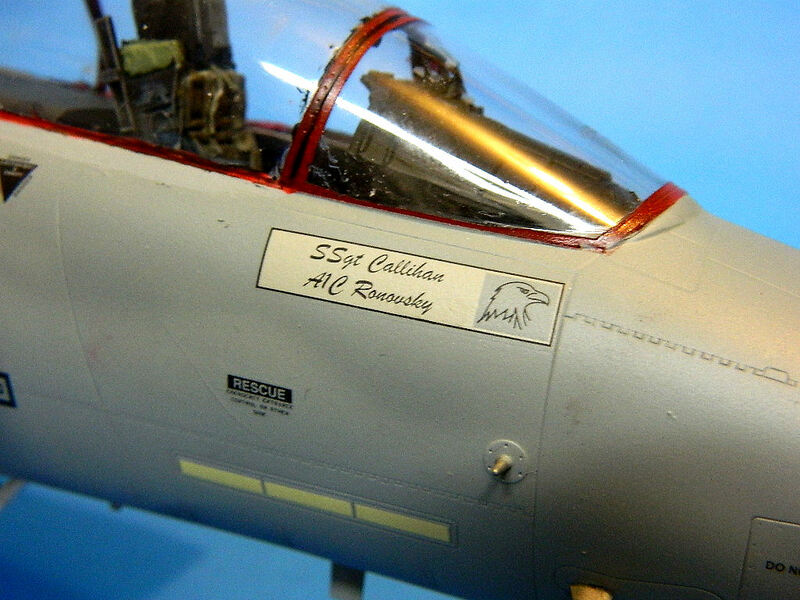 The decals themselves performed well over Glosscoat; printed by Microscale, they responded to Micro/Superscale solvents and techniques; no silvering, and the markings look painted on. A solid "10" for these sheets! Thanks again to Twobobs for the review sheets and to IPMS/USA for the opportunity to use them.